After previously insisting that it would not settle in a new case brought by SCA Promotions against its client, Lance Armstrong’s lawyers are said to have tried to reach a deal with the insurance company last week. According to Roopstigo journalist Selena Roberts, the lawyers proposed that a portion of the sum originally handed out to Armstrong be paid back. The amount concerned is reportedly $1 millon, and was rejected by SCA. This is not surprising: on October 31st SCA’s Jeff Dorough told VeloNation that a considerably larger sum had been demanded. He subsequently confirmed that Armstrong and his lawyers did not respond within the timeframe that SCA had stipulated, and that the company would be addressing its legal options as a result. SCA Promotions agreed a contract with the US Postal Service team owner Tailwind Sports during Armstrong’s Tour reign. The latter took out a policy, paying a premium to cover the performance bonuses that would be due to the rider when he won subsequent editions of the Tour. It paid him $4.5 million for his 2001/2002 and 2003 victories, and was due to hand over $5 million when he won his sixth Tour in 2004. However at that point SCA Promotions objected, saying that there were indications that his victories might not have been achieved clean. A court case ensued, SCA brought witnesses including Frankie and Betsy Andreu, who claimed that they had heard Armstrong admit to using a range of performance enhancing drugs in 1996, but it eventually lost the case. The original contract had not included a stipulation about doping and so it was forced to pay out the $5 million, as well as an additional $2.5 million in interest and legal fees. In all, SCA Promotions handed over $12 million, a sum it is now trying to recoup. 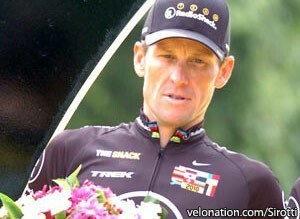 Armstrong has been stripped of his seven Tour de France titles and, as he is no longer the winner, bonuses paid on that basis can be disputed. The $1 million sum offered is a fraction of that total amount, but what is significant is that in trying to reach a settlement, Armstrong and his legal team have shifted their position from their original stance. In June Armstrong’s lawyer Tim Herman wrote to the company and rejected any notion of handing back any money. The move in that position is both a reflection of Armstrong’s fall from grace, and also of what seems to be a vastly changed stance of the Texan’s legal advisors. If the SCA Promotions case progresses to a trial, there is a chance that Armstrong will be called to give evidence under oath. He’s already denied doping once while giving sworn testimony and with the threat of perjury hanging over him if he is not truthful, may well be seeking to avoid a trial. If so, his lawyers will have to offer a lot more than $1 million as a settlement. However that would not be the end of the matter; the Sunday Times is also seeking to recoup the settlement it paid out in an earlier case and, according to Roberts, a qui tam whistleblower suit filed by Floyd Landis in May 2010 is moving forward. She quotes a source as saying that the Department of Justice could decide in the next two months if it will also join the action. Either way, the expectation is that Landis will push ahead. If that case is successful, the losses faced by Armstrong and the others named in the suit could be in many tens of millions.